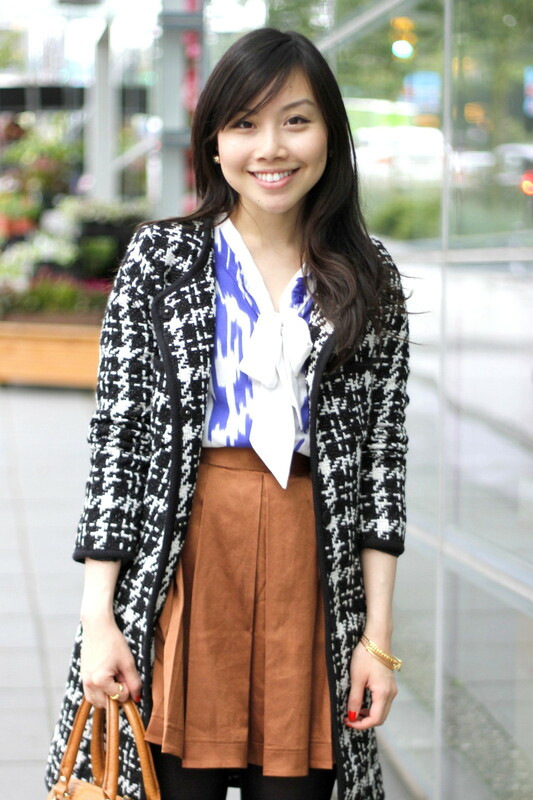 While I love to wear and mix patterns, I’m usually quite calculative in the way I style them. I go by a few rules and stick with safer options to avoid a potentially overwhelming outfit. Perhaps I was feeling adventurous (or maybe it was the ridiculously cold weather we’ve been having lately), but I decided to throw on my houndstooth jacket on top of this ikat cardigan last minute, while heading out the door yesterday. I still haven’t decided whether or not I completely like the result, but it was a good reminder to just abandon the ‘rules’ sometimes and have fun with fashion. I’m not usually a bangle girl as they usually slide right off my wrists, but the expandable wires on these fun Alex and Ani pieces make them so easy to wear. See a more detailed shot of them here! I love the brown skirt of you!! <3 Always classy and chic! Love that pattern mixing! You’ve done it really nicely! Oh I am in love with the houndstooth! The two patterns mixing goes well in this outfit. Love your jacket! Love the outfit. The mixture of patterns and colors is lovely. This is perfect. Ah, when I saw this on Instagram I totally thought your cardy/bow blouse combo was one piece. Love it, Jen! i love the pattern mixing jen, really cute! btw, i read your guest post on twentyonetwo.com and am so glad you explained your blog title and the correct pronunciation because that has been something i’ve wondered about since i first started reading your blog! These patterns don’t clash at all, they look great against each other! The blue is so vibrant that it really brings everything to life against the more neutral tones. You do the a-line skirt so well! 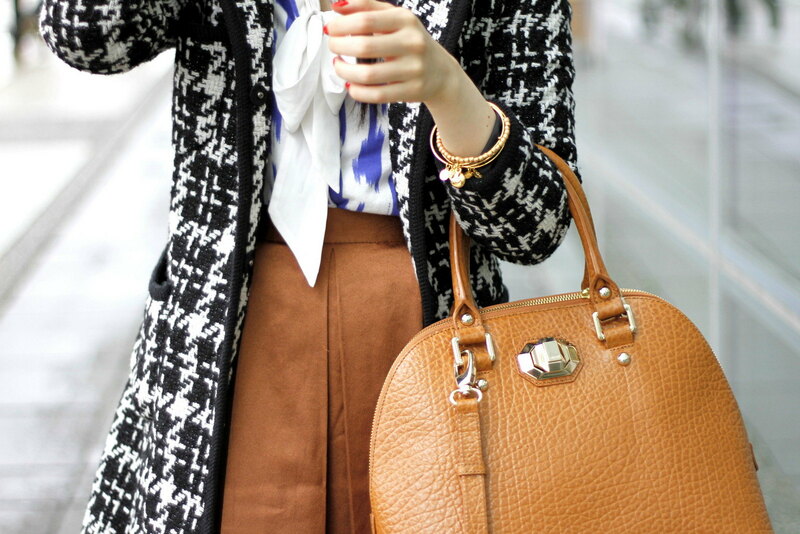 The mix of patterns is perfect!